On his Key of Solomon website, Herschel writes a great deal about Christianity and the secrets that it hides from the public. Herschel speculates about the origins of Christ and that the truth shall be released on his website. He even apologizes to his readers explaining that he doesn't want to discredit Christianity and quote 'once the truth emerges the significance of the Christ will become much clearer'. According to some scholars, the birth date of Christ may have indeed been derived from the Roman festival of Deus Sol Invictus ("Unconquered Sun God"). Joseph Ratzinger (current pope Benedict XVI) challenged this theory by arguing that this date was simply calculated by adding nine months to the date of Jesus conception (25th March). So Jesus, his conception day, his day of dying (Good Friday, the Friday preceding Easter) and his birthday all have an astrological significance since they concern the Vernal Equinox and Winter Solstice. In Eastern Orthodox churches, Jesus is still called the 'sun of righteousness' and an orthodox prayer still reveals the connection between Jesus and ancient Sun worshipping. Thy birth, O Christ our God, rose upon the world as the light of knowledge; for through it those who worshipped the stars were taught by a star to adore Thee, the Sun of Righteousness, and to know Thee, the Sunrise from on high. O Lord, glory to Thee. These coincidences cease to be coincidences altogether when one starts to understand that the Sun worship overtones in Christianity date even further back in history. In ancient Egypt for example, the Sun-god Horus was born on the 25th December. Horus was the son of Isis, the virgin mother who immaculately conceived Horus. The occult Black Madonna veneration within Christianity is argued by many writers to be the secret veneration of Isis, the mother of the Sun God instead of Mary. The writers Jordon Maxwell and Michael Tsarion both specialized in astro-theology have written extensively about the ancient roots of Christianity and it's astrological background. The Sun not only reincarnates at the 25th of December in the annual solar cycle after having 'died' at the zodiac cross at the Winter Solstice (why did Christ die on a cross? ), it is also reborn in the Precession Cycle after the Sun has passed through all of the zodiac signs in Plato’s Great Year (25,920 years). Around 2012 the Sun will be reborn in the precession cycle! In Mathew 28, Jesus speaks after his resurrection to his apostles in Galilee mentioning that he will be with them until the "...End of the Age." and teaching them to obey everything that I have commanded you. And remember, I am with you always, to the end of the age. The end of the age is not only referring to the end of the Age of Pisces, but to the end of the Precession Cycle as well. The Sun is always near, or with, the 12 zodiac signs (the 12 Apostles) for they are bound to the ecliptic, and the Sun passes though them along its path. Mother Isis (Egyptian precursor of the Christian Mary) holds the key to unlocking the birthplace of her son Horus (the precursor of the Son of God, Christ) and uses exactly the same symbolism as used in the painting of Eglise Saint Maurice. 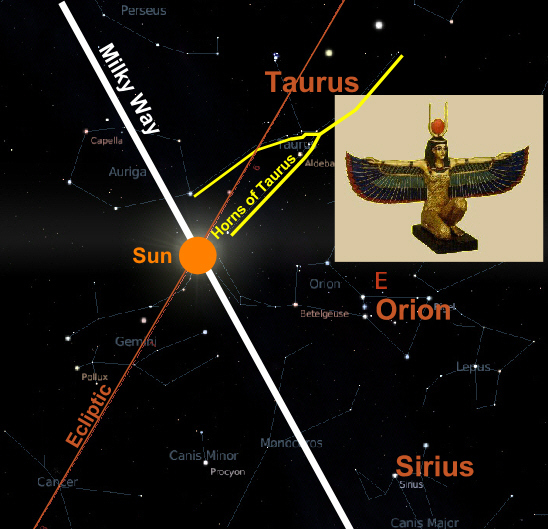 At the Summer Solstice of the current Great Celestial Conjunction, the Sun will reside in between the horns of Taurus! 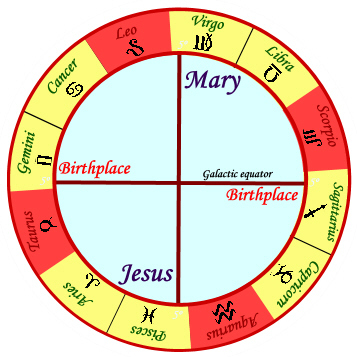 The astrological significance of the birth of Christ (birth of the Sun) becomes clear when one understands that the virgin mother Mary corresponds esoteric with the zodiac sign Virgo while Christ corresponds with Pisces. Christ was a fisherman and the general symbol of Christianity is the Vesica Pisces (fish symbol). This symbol of Christianity is still in use today and often seen used on bumper stickers. Esoteric significance of the Galactic Cross that connects the mother (virgin, Virgo) with the son (fisherman, Pisces) and the birthplaces of the Sun. The French cathedrals that were built with the wealth collected by the Knights Templar conceal the same Christian secret about the 'End of Time'. Read this article to learn more about the 'End of Time' secrets that have been encoded in the French cathedrals .